The defender who decides to hold out in place in strong points and improvised fortresses usually employs emergency measures rather than defense tactics. The Germans were forced to resort to such measures because of the acute manpower and materiel shortages from which they suffered once the war had spread all over Europe and to North Africa. In Russia, the overextended front lines, the bitter struggle against a superior enemy, and the elements of nature led to an expenditure of forces for which German manpower resources and industrial potential were insufficient. The long duration of the war accentuated these deficiencies with the result that position defense in improvised strong points and fortresses became ever more frequent. 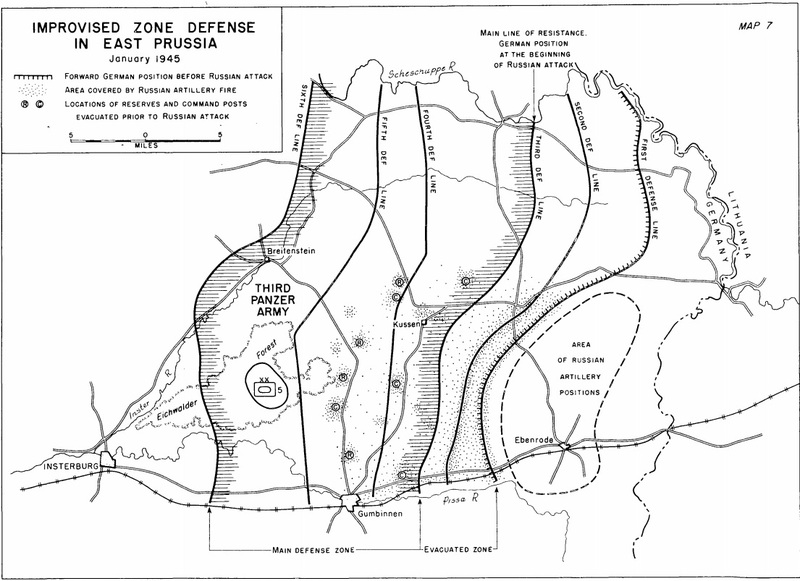 Excessive losses, difficult terrain, and bad weather forced the Germans to anchor their defense system on inhabited localities along wide sectors and to use these defense areas as substitutes for a continuous front line. These tactics often proved effective because they helped to gain time and overcome critical situations. During the winter or during the muddy seasons, for instance, holding villages and towns was the only way to escape annihilation. Then, it was the weather and terrain that imposed the adoption of these emergency measures. During the summer and dry weather many an enemy break-through attempt was delayed and whittled down by the same tactics until the Germans were capable of containing the Russians along a continuous line prepared in the rear. Service troops took a major part in the defense of inhabited localities. In most instances they built and improved fortifications in areas where they were stationed and made strong points of them. Frequently, supply elements were organized into alert units and committed as replacements in the most forward fortified areas. The system of mutually supporting strong points provided for defense in depth and maximum utilization of all available forces for combat purposes. Every soldier in a headquarters or service unit and in rear installations received combat training with emphasis on proficiency in the use of antitank weapons in close combat. Whenever the training schedule was rigidly adhered to, the results were favorable. In 1943, for instance, in Zolochev (near Kharkov) a divisional bakery company stopped Russian tank units which had broken through, destroyed several tanks, and forced the remaining ones to turn about. The practice of defending strong points should, however, not be overdone or adopted as a standing operating procedure. It would be wrong to order all unit trains and supply trucks to stop in the midst of a withdrawal and make their service personnel fight to the last man. If such an order was obeyed to the letter, it would lead to the loss of all transportation facilities and disrupt traffic. This, in turn, would jeopardize the supply of the combat forces, greatly impair freedom of maneuver, and result in disaster.